Bev Risman is a former dual-code international who later became a coach. 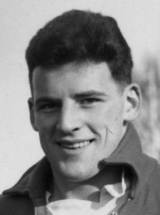 He played eight times for England at fly-half between 1959 and 1961, as well as touring with the Lions, before signing to play rugby league for Leigh in March 1961, ending his union career at a stroke at the age of 23. He enjoyed a time in league with Leigh and then Leeds, making five appearances for Great Britain including three as captain. After retiring he worked hard to develop the game in the south of England and in 2005 was inducted to the rugby league Roll of Honour.